I have searched for my third Great Grandfather, James Gates, for almost forty years. He seemed to hold the key to my identity and I just couldn’t give up looking. I knew James and Eliza Mercer Gates settled in New York Mills, Oneida County, New York. In 1976, I traveled to Whitesboro, Oneida County, New York to see if I could pick up a trail for James and ELiza. I found them in the Whitesboro Cemetery. The stones were old and weather worn. I decided to do some stone rubbings. I still couldn't read the dates, but for a moment the letters on the worn stones glowed with clarity, as if they had been blazened with light. I copied down what I could read. But, when I sent the records in for their work to be done, they were turned down. This was a huge disappointment after traveling so far. Long years passed, almost thirty, before I picked up that trail again. The census records said they were from England, but I didn't know where in England to look and didn't have a hope of finding out either. I longed after this family. My search from them makes me believe in miracles and the spirit of Elijah. Since I wrote you, I've found the letter telling of my father's birth and his mother's death. It may help you in your search for the Gates family history. I don't know of anyone else is interested in that line, so keep the letter and pass it on to your children. The four brothers mentioned in the letter, George, Alfred, Joseph and Stephen Mercer were Eliza's brothers. I often heard my father talk of them. And the one who wrote the letter was evidently a sister (Eliza was the only girl. I think the author was George Mercer's wife's sister, though I can't yet prove it). The three children left were Jim, Ann, (a beautiful girl, I have her picture) and Edward E., your great grandfather. We were so happy to have your Grandpa visit us after all these years. I'm crazy to make a trip to his ranch and get acquainted with your mother. Don't know if I'll ever get my wish or not. I'll be 85 years old in August. I am in good health and get around fine, but my husband can't seem to stand long rides, gets sick, so we have to stay pretty close to home. Maybe he will get over that in time. Your Great Aunt Opal (Opal Iona Gates Bibens, born 9 August 1875, in Chariton, Missouri. She was married to Walter Bibens and had two sons). 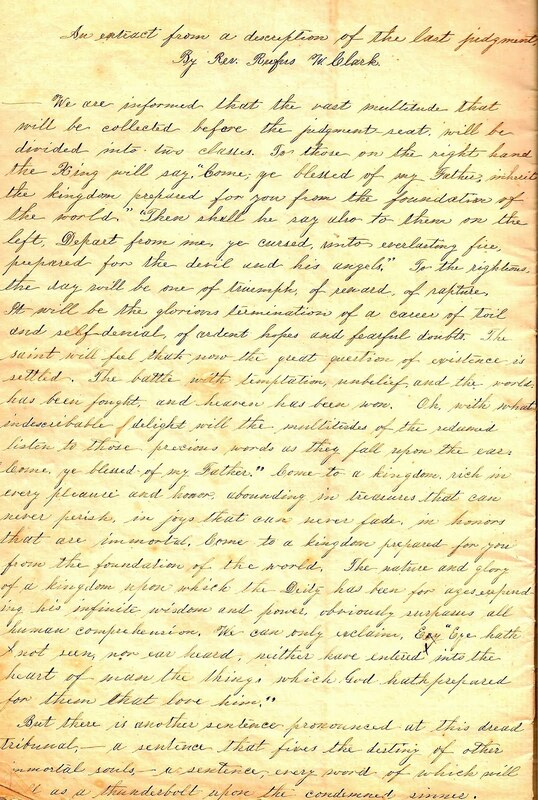 This heirloom letter is the foundation from which knowledge of this family begins. We are indebted to M.E. 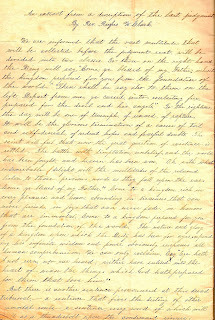 Leach for writing the letter and to those who treasured it and handed it down, probably George Mercer who first received it, and Edward Earl Gates, son of Eliza Mercer Gates, who passed it to his daughter, Aunt Opal Gates Bibens, who handed it down to my mother, Betty Louise Gentry Lewis, who gave it to me. I wish the picture of Ann Gates had come down with it. It's sad to me that it is lost. I have ever esteemed it a privilege to hear from you by way of letter or paper—and I have found it a pleasure to write, but I must say it is a task at present and a hard one too. If I had not been requested and urged to do it, I could not undertake it at present. While I was reading your kind letter last evening and while my eye glanced over a few lines, I saw by your writing that you were all in good spirits, but how sad the reverse when you get this—it seems you cannot feel worse than I do—O dear brother, prepare to hear the worst. How can I write it. Last Saturday at four O'clock in the morning, your sister Eliza was taken sick. She was as comfortable as could be expected in such circumstances. She had a son which weighed nine and a half pounds. He was born about eleven O'clock the same day. She got along pretty smart. I went to see her Sunday noon . She was very cheerful and smart when I left her and continued so until Wednesday morning. She had the appearance of a broken breast as she has had before and she thought it so painful she put oil of some kind and washed it in peppermint to dry up the milk in that breast. The Dr. thinks it was used too fast and dried up the milk all at once and scattered it all over the system. She began to fail slowly. She was sensible of it herself and waked Mr. Gates (James Gates born September 4, 1804 in Tenterden, Kent, England) in the night and told him she did not feel as well as she had. He went for the doctor. Her lips were purple and very much swollen, the doctor told me when he first saw her. She had changed so much during the night, it frightened him. He gave her some new medicine. She appeared a little better. Through the day and night following, she began to fail again. Thursday and Friday, about a week later, she lost her senses, but she came to herself for a short time and said to Mr. Gates that she should not get well and he must prepare himself for the change that would shortly take place in her. She told him many things which he could not utter to me, but will tell you when he writes. She said she was happy and willing to die if it was God's will. She soon lost herself again and seemed to be asleep most of the time. They thought she needed rest. They did not know it was the sleep of death. She lingered along without much pain until Friday noon when she spoke, I believe, for the last time, but what she said, I have not learned. Mr. Gates was at home all the time. She had Mrs. Vandyke to nurse her and had good care. They were astonished to see her fail so suddenly. They forgot to let me know it until she was struck with death. Joseph and wife (Lois Hastings) were sent for. They were there before she died, or Joseph did, but went off after his wife and he did not see her die. I got there one hour before she breathed her last. Her eyes were closed and I did not see them open again. She did not know anything. She died very easy. They had a council, but nothing could be done. Mortification had taken place already. I stood over her with Mr. Gates when she breathed her last. The house was full, but none in the bedroom but Mr. Gates and myself and Ann (Eliza Ann Gates, born in 1832) and the doctor and the room was small as Joseph and wife were not in 'til she had gone. He felt dreadfully to think you and Alfred could not be there to see her breathe her last and sympathize with him. But I must say, I felt for him if ever to see him wringing his hands in agony over his beloved wife. He caught my hand and said how would brother George feel if he was here? All in the house were in tears. She gasped and breathed no more. She looks as pleasant as when living—but the tears fill my eyes and I cannot see. O, if you had been there last night between seven and eight what a scene you would have witnessed. We thought we could not have her buried on the Sabbath, that is tomorrow, and you could not have got here in time. They will send for Stephen. Mr. Leach and myself sat up last night. Mr. Gates has been very friendly with him of late. Mr. Gates will write to you as soon as he gets collected, perhaps next week, and tell all that I have left untold. He is in trouble with three little children. Mrs. Evans will want Ann if he will let her have her. She is going to be buried beside Mrs. Laurence. Mr. Leach thinks he shall not stay here long as the factory is to stop soon a part of the winter and there is nothing but orders to be had, hard times. Write me as soon as you get this. I think he would like to get a good place within six or seven miles of you. Mr. Everts is here now, one of his friends from Brockport. He is trying to cause him to go to West Avon or somewhere where there would be a good place. Do you know of a good one? If so mention it. Love to all. Tell my dear mother I want to see her much. Write to me as soon as you get this without fail. In the late 1960's, while I was at BYU, I searched for and found James Gates in the 1830 and 1840 censuses. When I began to search again for the family in 2004, I found a record of James Gates in the 1850 and 1860 censuses along with the names of his new wife, Mary A. and their three children, Anne E., William M., and Benjamin J. Gates. By 1860, James was living with his son, William M. Gates in Whitestown, Oneida, New York, according to that census. (There is a brief history of William Gates following). I was able to find all the family in one census or another, except Ann, who is mentioned in the letter as the oldest child of James and Eliza Gates. Her birth year, 1832, came down to us from Aunt Opal Bibens. Because there were no names listed in the 1840 census, I couldn't find Ann. By 1850, when each person in the household was listed by name, she didn't appear. Aunt Opal said she was a beautiful young girl and had died very young. (A notebook filled with Eliza Ann Gates' beautiful cursive writing has come down to us.) I didn't know if she had gone to live with Mrs. Evans or not. I searched the census records for an Evans family with a daughter named Ann about the same age, but could not find one. In the spring of 2005, I decided suddenly to go to Europe. I was surprised to hear myself say it, not knowing beforehand where it would lead. But as soon as I made the commitment, things were set in motion. The ocean had always been a barrier in my research and I despaired of ever crossing the pond to find where the Gates family came from in England. I ordered a microfilm through the family history center. I don't know why I ordered that film out of all the microfilm numbers in my notebook, but when it arrived, I found a family group sheet detailing Eliza Mercer's family. The records said Eliza was born in High Halden, Kent, England. Eliza Mercer married my James Gates. I figured in those days, they probably didn't travel too far to meet their mates, so concluded James must have been born in that area too. I had always believed they had married before they left England, but I couldn't prove it. I ordered 10 more microfilms to do some advance research. I found many Gates and Mercers in High Halden, even a James and Elizabeth Gates and some of their children, who I believed were James parents and siblings, but I couldn't find my James’ birth record, so I just wrote everything down. I went to the internet and rented a cottage in High Halden. Now I knew where I was going. This was a village at the end of the rainbow. We think England is a small island, but it isn't when we're on the ground. When I arrived in High Halden, I headed for the churchyard. There nestled under an old oak tree were several stones bearing the name Gates. I rushed to look at them closely. Some of the words were worn out and I couldn't read them. One of the graves was for James and Elizabeth Gates and four of their children, but the dates were wrong. I didn't know how they fit in. Sunday, I attended the meeting at Saint Mary's Episcopal Church and met the local people who were very kind to me and took a five mile hike with my landlords on ancient trails. I had made a reservation before I left Las Vegas, for a microfilm reader for a week at the "Center for Kentish Studies," in Maidstone, the county seat of Kent, requiring a bus trip from High Halden to Ashford where I caught a train to Maidstone. It took considerable effort. I'm not as young as I used to be and my health was tentative following an accident. When I arrived at Maidstone and stood waiting for a friend to pick me up, at the railroad station, I listened to a babble of voices around me. A voice in my head said, "These are the voices of your ancestors," so I tuned in. I had difficulty understanding them. They spoke with heavy accents for American ears, and I wondered if we could communicate when I meet them again. There was a prayer on my lips every step of the way to Maidstone first that I would hold up and second that I would find what I came for. Every morning, I made the trek and back at night. After days of searching without success, I was feeling pretty foolish and sheepish. I had come so far against all odds of my being able to find what I came for. I worked so hard, the Lord just had to bless me, didn't he? I searched through the last day, and skipped lunch because I was running out of time. When I finished the last film for High Halden, I concluded he was not born there, boy, am I a slow learner, but where? I thought, "You've done your best. It isn't here." I was tempted to go back to my cottage and cry. But you know, being magnificently possessed, I just couldn't let it go when I still had an hour that I could work. I was frozen for a moment. I prayed. There were ten towns around High Halden I could search, but I didn't know which one and I was out of time. Then I remembered I wanted to search in Tenterden, a town six miles south of High Halden. I looked at my watch. I had an hour before the center closed for a four day holiday weekend. I found the film. It was a short piece of film. I began to read, page after page. I was exhausted and dazed. I was almost blind from looking at microfilm too long, and I missed it, but then I saw it, and I thought I had seen it before. I've searched 100s of hours in microfilm and never seen a duplicate record. I rolled the film back and forth several times just to convince myself that James Gates, born of James and Elizabeth Gates, 4 September 1803, was on this short piece of film twice. I don’t know if it is still that way, but it was that day and I caught it. I searched for James and Elizabeth's marriage record. Guess what was on their marriage record, "James Gates of Tenterden parish and Elizabeth Blinks of the same parish, married 17 October, 1802." I had found James Gates father and mother and his mother's maiden name – Blinks. Now I was able to search for her parents, and found Samuel and Elizabeth Blinks and Elizabeth's brothers and sisters, Edward, George, Ann, and Benjamin. I've wondered for awhile where the Edward in my great grandfather and great great grandfather's names came from. There were no Edwards anywhere in the Gates or Mercer families before, but James Gates brother was named Edward, and the Blinks family was full of Edwards, so I solved a little family mystery for myself. We just have to endure through that last impossible hour, because it is in that hour that miracles happen. We have to be in the act of doing for breakthroughs to happen. I know this from being a writer. If I put my bottom in the chair in front of the computer, somehow over time, miraculously, a screenplay takes form. ﻿ I decided to stay a couple extra days at the cottage in High Halden so I could visit Tenterden. What a treat to find a very picturesque town. The graveyard at St. Mildreds contained large stones for the Blinks family. While there, I met a young archivist who had a book compiled when the details of the stones were more easily read. He, as good as his word, emailed me this inscription on Eliza's father, William Mercer's tombstone at the "Old Meeting House," a Methodist church on Ashford Road, which read: Sacred to the memory of William Mercer, late of this parish, who died 31st October, also Mary Mercer, his wife, who died 25th March 1863, aged 85. Had issue Eliza, who died 29th November, 1839, aged 35. Left surviving William, Joseph, James, Stephen, George and Alfred. ﻿ This was poignant to me, because my Eliza had died so far from home, across the ocean in New York. There is a story here about a father who missed his daughter, I think, to find her death information carved on his own tombstone. When I returned to Las Vegas, I was able to verify that my James’ parents were the same James and Elizabeth I had found before I left home. They had left Tenterden for High Halden by then. I had actually been to their graves, but didn't know it until I came home and was able to review the dates in my big notebook. Knowing the families were Methodist in an Episcopal country gives me some insight into why the young members of both the Gates and Mercer families came to America. My grandmother, Gladys Gates Gentry told me she grew up Methodist. Just a tiny bit of trivia. There is a plaque on “The Old Meeting House” Where the Gates and Mercer families went to church that states Benjamin Franklin visited the church. Grandma Gentry also told me an ancestor was a tailor for a King. I'm still trying to figure out which line of the family it could be. James and Eliza's son, Edward Earl was a maker of fancy shoes for women, so that talent could have come down from a tailor to a king, but the name Mercer means a dealer in cloth. So it could also be that line. The mystery continues. I found this on the internet about William, one of the brothers of James Gates. The name of William Gates still brings a gleam to the eyes of Frankfort folks, and to Herkimer County residents. They enjoyed pointing to the Gates Home, the site of the old Match Factory. A display of a collection of Gates matches in the village library attracted much attention. The manufacture of friction matches began in 1844. These man-made matches were cut in three-foot lengths, both ends dipped in Selfware, dried and cut in half, making the finished match one and one-half feet long. It took great effort and patience to introduce this new fire maker to the public. Gates, however, met the challenge and enlarged his factory eight times, operated 19 buildings, and employed three hundred people. During the 13 years when the factory reached its peak of production, the United States Government collected more than three million dollars of revenue on one cent a box of every one hundred matches. Later the interests were joined with the Diamond Match Company and after 50 years of prosperity in Frankfort, the industry was moved to Oswego in order to be nearer the lumber resources. The village of Frankfort was incorporated on May 7, 1863 and by 1872 had four churches, a bank, a grist mill, a saw mill, woolen factory, and the match factory owned and operated by William Gates. The village was a principal manufacturing center for the Central New York Center for the West Shore Railroad. The railroad buildings are still here, but occupied by the Union Fork & Hoe Company and other firms. HISTORY OF HERKIMER COUNTY by George A. Hardin, Frank H. Willard, 1893. HISTORY OF HERKIMER COUNTY 1791-1879 by F. W. Beers & Co. 1879. Data compiled by Esther Hays, volunteer for Frankfort Free Library; member Daughters of American Revolution, Col. Marinus Willett Chapter, Frankfort; member Colonial Dames XVII Century, Mohawk Valley Chapter; member Daughters of Founders and Patriots Early Frontier Chapter, New York State. After a time for mourning, James Gates remarried Mary A. and bore three more children: Ann E., born in 1842, William M., born in 1845, and Benjamin J., born in 1847. I fretted about whether or not to have Ann Gates sealed to her parents, not knowing if she had gone to live with Mrs. Evans or not. One day I received an impression I should do it, and so I did the paper work. While I was on the Oneida County website, in anticipation of writing this history, I found a wonderful site with several links to the history of the area. There was a link to the Old Trinity Episcopal Church Baptisms 1829-1836. At first sight, I didn't think I needed it, but I had opened all the other links, so decided to open them all. To my surprise there was Eliza Ann Gates baptism record for October 5, 1835. Her parents were given too, James and Eliza Gates. What a happy ending after so many years. Never give up. The Lord is in His work and I believe our ancestors have their hearts turned to us as much as we have our hearts turned to them. I personally did Ann's sealing to her parents April 19, 2006. It was a very moving experience, even the sealer was crying. Afterward, he asked me who she was and I told him a bit of this story. He thanked me for bringing in the names, including hers, whose work we did that day. I feel it was a day the family had waited for. All the James Gates family work is complete as far as I know back to the beginning of records in Kent in 1500.